I have finally setup myself with QSL cards. The design was made up in PowerPoint and I print up 4 to a sheet and then slice & dice. This may be the long and hard way, but for now this is it. 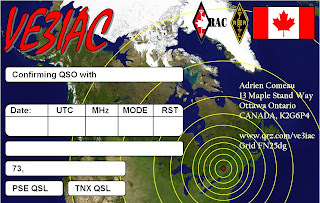 I've started sending cards to as many of my QSO's that use direct. For the moment, I'm quite interested in gathering these tokens of the great distances I've been able to communicate. Thanks to all to QSL back. In the fall I updated my radio shack to provide for a bit more desk space. 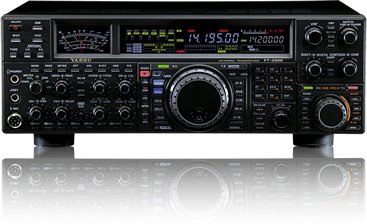 Radios are the Yaesu 200w FT2000D, truly a basestation radio, the I-COM 7000 a nice 100W all mode HF/VHF/UHF mobile transceiver, and a classic, not quite a boat anchor, Kenwood TS-850AT. I purchased my FT2000D late summer 08. I spent many hours pouring over as much material as I could find to help me make this decision knowing that this would be the radio I'd have for many years. I also looked at the IC756PROIII. In the end I decided to go with the FT2000D.